Every morning, billions of photons are sent streaming from the sun toward planet Earth. When they strike a surface, the atoms get excited and begin to move faster, generating heat, or warming up. This process is called thermal conduction and is the scientific principle behind the design of passive solar water heaters. A passive system uses no moving parts or fuel, so there is no pollution. 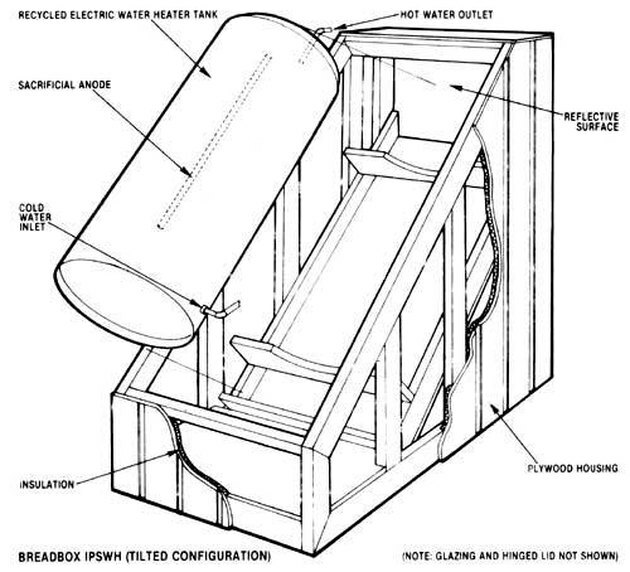 Following these directions you can build an inexpensive, simple passive solar water heater that will heat water to 150 degrees. Wash the drums, inside and out, with a mild bleach-and-water solution. Allow to air-dry. Paint the exterior of one drum with flat black paint. Select a sunny, south-facing site for your water heater. Mark off an area 5 feet by 5 feet. Dig a trench 2 feet deep. Create a flat incline from the steps formed by the east and west walls by filling them with cement. Make frames for the cement from the plywood boards. Align the boards along the inside and outside faces of the walls and hold them in place with pipe clamps---one at the top and one at the bottom. Using ready-mix cement, fill in the steps and create a smooth surface along the inclined sides of the frame. Install the insulation. Cut insulation to fit the inside of the frame. Line the entire frame shiny side out, setting the insulation so it slopes from the top of the frame into the center. Join pieces together with duct tape, forming a "dish" to hold the black drum. This dish can be supported from behind the insulation by using sand or dirt. Remember, the drum will need to be at the same angle as the sloped sides of the frame and will need to be placed far enough below the frame for the glass cover to fit over. Grind away the ridge on the inside of the ½-inch sweat at the top (non-threaded end) of the pipe fitting. Cut a 7-inch length of pipe and insert it into the fitting so that approximately 2 inches protrude from either end. Solder the pipe and fitting at the top joint. Cut a three inch section of pipe and insert it into the other ½ inch opening and solder the joint. Cut the garden hose into 3-foot sections. Using a hose clamp, attach a section of garden hose to the pipe at the fitting's threaded end. Run the hose through the ¾-inch hole in the drum, securing the threaded fitting into the opening. (All other openings on the drum should be sealed shut). Using a hose clamp, attach a section of garden hose long enough to reach the cold-water supply to the pipe that extending from the top of the fitting. Attach a third piece of garden hose, long enough to reach the hot-water valve, to the other piece of pipe. Position the drum inside the frame, on top of the insulation. Make sure the pipes are at the highest part of the drum. Cut holes in the insulation to run the hoses out of. Connect the hose leading out of the very top to the cold-water supply provided by the second 55-gallon drum. This drum is filled with unheated water and elevated above the solar water heater. Gravity moves the water from the cold-water source to the heater and finally to the hot-water outlet. Once the two are connected, fill the water heater with cold water. Connect the hose attached to the side pipe to the hot-water valve. Place glass over the frame. Wait a few hours, checking the system for leaks. Open the hot-water valve. As hot water runs out, gravity draws cold water in. Heat rises, pushing the hottest water to the top of the drum. For the most effective use, the inlet hose should run to the bottom of the drum while the outlet hose should only run into the top few inches to draw off the hottest water and prevent the incoming cold water from mixing with the water that has already been heated.